The Collection, though small in scale, encompasses paintings and sculptures of exceptional quality by the key artists who were instrumental in importing and extending the ideas of the European avant-garde to Britain. Contemporary additions provide new insight into the core collection and create an active dialogue between twentieth and twenty-first century works helping the collection as a whole to evolve and develop in enjoyable and stimulating ways. A selection of works by artists whose engagement with landscape reveals an interest that goes beyond literal reinterpretation. A Life of Giving includes letters, publications and photographs relating to the life and legacy of Margaret Gardiner. 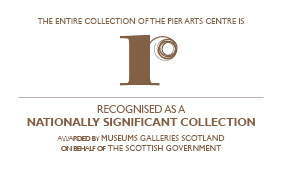 An exhibition including work by six artists from the Pier Arts Centre permanent collection selected by Orkney College UHI third year fine art students. DELINEATIONS – Orkney’s Art Graduates 2017 & 2018 brings together the work of the latest group of Orkney artists to have graduated from art schools and universities around the country. The Pier Arts Centre presents its annual celebration of art and craft by artists and makers who live and work in Orkney. Barbara Rae: The Northwest Passage presents a new body of work which draws parallels between her journeys and Orcadian explorer Dr John Rae. This year marks the centenary of the poet W.S. Graham’s birth. This display includes illuminated manuscripts, decorative letters, watercolours and oils, to show the breadth and diversity of Graham's creativity. A display of artwork by some of Orkney’s nursery children. An exhibition bringing together a selection of Tam MacPhail’s sculptures, drawings and related material, and photographs by Paul MacPhail, one of Tam and Gunnie’s sons, who grew up in Orkney. Paul’s work plays with the notion of scale and human presence in the landscape. A selection of work by pupils from the Higher Photography class at Kirkwall Grammar School's Art Department. This new exhibition showcases the work of five rising stars in applied arts who have all received a unique commissioning opportunity from Jerwood Visual Arts. This annual exhibition at the Pier Arts Centre is a core part of the Professional Practise Module for BA Level 3 students at Orkney College UHI. Third year students Kelly Marwick, Ruth Tait and Sarah Wylie elected to curate and present this exhibition, working with gallery staff to gain experience of working within a gallery environment. The Pier Arts Centre will be carrying-out annual winter maintenance from 1 January - 10 February 2018. Some parts of the gallery may have restricted access during this time. Display of new work by local artist Louise Barrington. The exhibition is a celebration of Stromness through paintings, prints and photographs bringing together a cross section of historic and contemporary works of art that show how artists have studied, interpreted and re-presented images of the historic town. Anne Bevan, artist in residence for Orkney: Beside the Ocean of Time, a multi-disciplinary research project, presents an open studio, gathering together responses to the Stromness West Shore through video, sculpture, drawing and print. Endeavour brings together works that have developed as part of a collaborative project involving South African artist Neville Gabie, the Piergroup and students from Orkney College Art and Design Department. Innovators celebrates the work of the latest generation of Orkney artists to have graduated from art schools around the country.